As an amateur student of American history, my reading and research has upended three previously held beliefs. These are, in no particular order, the belief in upward social mobility, the belief we are a society without a class structure, and the belief we were founded as a Christian nation. A book I recently read, White Trash: The 400-Year Untold History of Class in America, addresses the first two. Author Nancy Isenberg dismantles the myths about class and mobility in a fairly straightforward — and at times a very direct — manner. 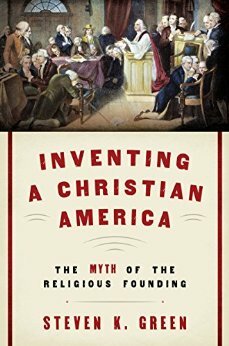 The approach of author Steven K. Green in Inventing A Christian America: The Myth of the Religious Founding, feels a little more lowkey. Like White Trash, Green’s book is very detailed and highly readable although some may find Christian America controversial since Green does not believe the country was founded as a Christian nation. By reading other historians, like David Hackett Fischer and Colin Woodard, I had already come to the conclusion that the country’s founding was significantly more complicated than the simple narrative I had learned about the Pilgrims. In Albion’s Seed, Fischer highlights the differences in the four British American colonies. Woodward’s American Nations builds on this idea by looking at the 11 nations that eventually became the United States. In Christian America, Green opens by developing a backdrop of the country’s early years. He dips into the writings, laws, practices and religious beliefs of that time period. By unwinding how the Christian Nation Narrative began, Green gives the reader a stronger understanding of just how complicated — and diverse — society was in the years leading up to 1776 and beyond. And his approach is fair. Green does not shy away from the various Christian influences in early American history — like early Supreme Court rulings or the decision of Congress to hire a chaplain to open sessions with prayer. Nor does Green bypass the only religious reference in the Constitution — the clause prohibiting religious tests for office (i.e. I believe Jesus is the Son of God). He fearlessly broaches both sides of the argument, painting a detailed picture of the thought-process and precedents behind the Constitution, the Declaration of Independence and other founding documents. He does not cherry-pick statements, quotes or arguments to prove his position. Instead he lays it all out — both sides of the argument — while explaining why and how he arrived at his conclusion. He most certainly does not come across as anti-Christian. He comes across as an historian on a quest to understand how and when the Christian Nation narrative began. In some ways, the book reminds me of a well-crafted Sherlock Holmes story, because Green embraces a wide body of evidence, and then he whittles it down to his well-defended, and well-thought out position. Reading the book, I felt a like bit like Watson, wondering why I had not made the connections before reading the book (in my defense, though, I am not as knowledgeable on all of the early historical documents as Green is). In Green’s estimation, the Christian Nation myth started during the 1830s when the young nation, undergoing a spiritual renewal and a generation removed from the Founders, was seeking to understand why its republic and revolution succeeded when France’s did not. This prompted many writers, historians and clergymen to simplify the story of the country’s beginning. It also led to a desire of these writers to link God’s Guiding Hand to the Founding — largely in an effort to broaden the philosophical and political divide between the revolutions of the United States and France. Both revolutions were based on Enlightenment ideas, but the French revolution led to the persecution, and massacre, of Christians and culminated in the eventual dictatorship of Napoleon. In contrast, the American revolution led to religious freedom (at least for Protestant Christians) and a (mostly) democratically-elected republic form of government. So, to explain the divergent paths the revolutions took, writers in the 1830s deified the Founding Fathers while dismissing their Enlightenment beliefs. The words and works of the Founding Fathers were minimized as new stories — like the famous myth of George Washington cutting down a cherry tree — were invented to elevate the men into the role of conduits of God’s will. As Green points out, when the Christian Nation Narrative was created, the religious inklings of the population had shifted. The Second Great Awakening introduced a new strain of Christianity — evangelical Protestant — with a heavy emphasis on being born again and personal revelation. Being born again, though, would have been a foreign idea to the Founding Fathers, including many of the Christian Founders. As a whole, these men did not believe in revelations of a personal nature. Unlike some modern fundamentalist, the Founders easily combined science, rationalism and natural law with the spiritual teachings of Jesus. When the Constitution was ratified, many political leaders — including the Founding Fathers — were criticized for the creation of a non-religious Constitution that omitted the role Jesus/God had played in the country’s creation. Clergy and newspaper editors reviled the politicians for their ‘reckless’ behavior. If you are interested in learning more about whether the country was founded as a Christian nation — and can open your mind to the evolution of laws in society, it can be an enlightening book. The book is technical at times, dealing with concepts like higher law, natural law, covenants and compacts, but Green explains them in laymen terms. The book is filled with plenty of examples, anecdotes, footnotes and familiar figures to give the reader an appreciation for our country’s complicated beginning — a beginning that is significantly more interesting than the Christian Nation myth.